The Super Sky Cycle is a flying motorcycle. The Engine is a Rotax 912ULS 100 HP 4 stroke aircraft engine. 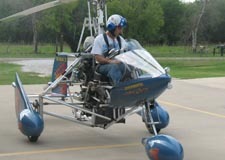 The Super Sky Cycle is centerline thrust autogyro with a horizontal stabilizer on a long moment arm. The airframe materials kit has pre drilled locator holes that will have to be re drilled to size and some of the tubes will have to be cut to length. The kit is intended for the experimental category where you as the builder fabricate at least 51% of the kit for recreation and education. The cheek plates and various other parts are cut to shape and have undersized locator holes. Inst: ASI, ALT, Engine RPM, Water Temp, 2 EGT, CHT, oil pressure, oil temperature, & Hobbs. The seat tank holds 7.5 gallons of fuel. The G-Force Magnum Landing Gear. The Super Slider Rotor Head (helps eliminate stick shake). Front & Rear Disk Brakes. The Super Sky Cycle Kevlar Tail with Cadillac Style Bullet Tail Light & License Plate Holder. Warp Drive 3 blade 68” propeller.